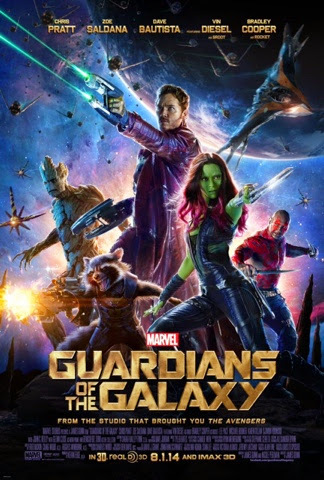 GenreOnline.net: My feature film review of Guardians of the Galaxy. My feature film review of Guardians of the Galaxy. I saw Guardians of the Galaxy over the weekend. It forwarded the broad story arc a bit involving Thanos and gave an explanation of the infinity stones, which we are already familiar with from some of the previous Marvel MCU films. Overall I think it was more of a space dramedy than a straight space opera. The story and film have little to do with what has been going on in the previous films so if you skipped it, you would not miss it, but if you saw it it would make the overall tapestry richer. I was disenchanted with the makeup for the aliens, which for the most part were just people in different color makeup. Even the laziest Star Trek episodes produced where the aliens were all but indistinguishable from the humans seemed a bit more real probably because of the writing on the classic series. Overall, it was okay and not bad in any way. I just think if one goes in expecting something heavier like some of the other MCU movies, one might feel a bit disappointed as I did too.